Often times, when we look at the datasets around us, we take the information for granted and accept the presented ontologies without question. This lack of awareness might be a problem because we would likely not realize it when data is presented in a way to manipulate your understanding. We should practice our analysis of data. For instance, we can look at the FY15 Fees, Fines and Penalties chart in Los Angeles City. This type of this dataset is a chart and the factors that constitute a record in this dataset include: the department name, revenue source name, revenue collected, revenue budget, fund name, revenue class name. According to Wallack’s and Srinivasan’s definition of ontology in ”Local-Global: Reconciling Mismatched Ontologies in Development Information Systems“, this dataset’s ontology is the different slices of the pie, such as Solid Waste Fee or Parking Fines. The different types of fees and the thickness of the slices make most sense to the City Government as it helps visualize the most “profitable” sources of revenue from fees, fines and penalties. Also, each governmental department might also find this chart useful if they filter to only their department and see which fees result in the most revenue. This chart seems to tell us that Solid Waste Fee and Parking fines are the two largest sources of revenue and, together, they bring in more than 50% of the all fees, fines and penalties collected. In this dataset, many details are left out, such as how many parking tickets are issued and for how much, and broader information is also left out, such as fees collected outside Los Angeles City. If I start over the data collection process, I can categorize the fees, fines and penalties from the payer’s perspective. In other words, instead of looking at the revenue collected by the government, we can look at the money paid by each individual. The shift in perspective changes the characterization and naming of categories. For instance, Municipal Court Fines, Private Transfer Station Fees and Franchise Income-Public Education & Government fees might all be categorized as Municipal Fees and parking fees might be called parking tickets instead. In fact, if we also collect some additional information, such as salary, whether he/she has a car, etc. With the collected data, we can then understand for instance, what percentage of the population (that has a car) pay all the parking fines and how many tickets are issued every year. Though the FY15 Fees, Fines and Penalties dataset from the Los Angeles City is presented in a relatively neutral, unbiased way, there are still aspects that can be misinterpreted, therefore, it is important to be aware of the information that is presented to us. This week, I chose to study the Vectors project, “Technologies of History” by Steve Anderson. This project was created with the idea of historical fixations in film, television, and media. Tara McPherson writes in her introduction of the project, “The project takes as its central object of analysis one of those moments of historical fixation that seems indelibly engrained in the American consciousness, the assassination of John F. Kennedy, Jr. in November 1963.” This seems fairly clear when one goes through the project; however, the interface itself can be quite confusing when thrust into it. While exploring the website, it becomes quite clear how to use it, and learn from the project. Although not necessarily easy to understand at first, it takes a little bit of time for the user to get used to the interface and how it functions. The website is divided into “topics” and “your history,” and from there, further subdivisions take you to your topic of choice. The topics tab and its subdivisions can be a lot to understand, but after playing around with each subdivision, it is clear that each tab will take you further into a specific definition or information regarding that topic. I think, considering the way that the author wanted you to consider every aspect of how JFK’s assassination has permeated certain aspects of media, the project does its job exactly, although it does not seem very clear from the start. I think this hurts the website, since figuring out how and why the website functions isn’t very clear and you have to dig through in order to understand, and even then it is still not very clear. The website is clean and aesthetically pleasing, and although that is good for an interface, it can still be confusing to work with. Overall, I feel like the project is successful, but only after navigating the site for a bit. Technologies of History, authored by Steve Anderson and designed by Erik Loyer is an interactive site that presents film, footage, and video game clips of the assassination of JFK. It is intended to analyze and bring into question the “entangled relationships among media, history and memory.” The project brings into question our reliance and trust placed on film or photography in the creation of histories through the close study of the JFK’s assassination, chosen for its pervasiveness in American culture. When opening the project, you are presented with the title of the project, author, and designer, along with a series of flashing images that seem to be from the second half of the 20th century, but they flash too quickly for one to actually comprehend what each is depicting. To enter the project itself, there is a Begin button at the bottom of the page. As one enters the project, each page plays the audio of a series of videos that are accessible and related to that page’s topic. For example, Digital History plays clips of video games with the audio playing off each. Each of the clips of audio and film are related to a piece of text that does not necessarily illuminate the film but draws into question what we gather from it. This navigation is ultimately successful because it intentionally plays with the questions that the project itself is attempting to address and question. The project is designed to question the authority of media and the site itself plays with obscuring and presenting information. While it is effective, I personally would have preferred a direct address of the project’s intentions within the project itself. For this week’s interface blog assignment, I chose Sharon Daniel and Erik Loyer’s Blood Sugar. Blood Sugar is a “voice archive” that features interviews from participants of an HIV prevention and Needle Exchange program in Oakland, CA. The audio details the experiences and feelings of intravenous drug users. Blood Sugar has a theme and aesthetic that captures the same feelings of intimacy , isolation and closeness that are heard in each of the users confessions. I was definitely left with a new understanding of addiction after each addict’s testimonial. The site was powerful in its authenticity but in stark contrast was unclear in terms of navigation. Before you even commit to launching the interactive flash site, it is not explicitly clear that Blood Sugar is about intravenous drug users. There are several definitions of blood and sugar and details about the project’s collaborators but no outright description of its purpose. Once I launched the site, there is an introduction by Sharon Daniel that explains the purpose but not how to effectively navigate the site. I then just began clicking different names and hearing corresponding stories. Each story comes with a set of terms to click on and deeper explore issues connected to drug use. But if you aren’t careful you can accidentally click on a different users terms while another users confession is playing. The design process for Blood Sugar was a particularly arduous one, and a reminder of both the dangers of technological determinism and the value of face to face collaboration. The above quote is found in the Vector Journal’s introduction of Blood Sugar. I think it highlights the collaboration problems that led to Blood Sugars confused interface. Technological determinism theory basically asserts that technology provides social change. I assume Erik Loyer is saying there was difficulties in collaboration because the creators weren’t working face to face. The narrative and the technological aspects of Blood sugar clash and that makes it hard to navigate. I think the collaborators were effective in the emotional impact of the project but had different views on how the layout should be connected to each story. Its obvious there was a decision to have stories overlap but because boundaries weren’t clearly defined certain things got muddled. I think if they wanted to keep the interwoven aspect of the site they should have had better communicated to the users how to go about those connections with out mixing up the visual and audio portions. I examined The Roaring Twenties created by Emily Thompson and Scott Mahoy. 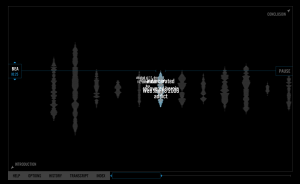 The site allows its users to interactively explore the historical sounds of New York City. The project deeply relies on archives and history. The authors used “over 600 unique complaints about noise around 1930 while reproducing over 35 pages of these materials. 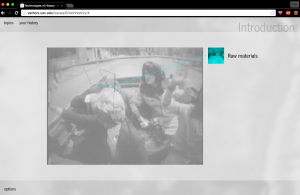 It also includes fifty-four excerpts of Fox Movietone newsreels, early sound experiments that at once captured and technologically remediated the sounds of New York City, as well as hundreds of other photographs and print materials.” Through the three interfaces of the site space, time, and sound, the user can feel like they are actually in New York City. After launching the project and clicking on the Sound interface, we see vintage inspired illustration with the title “City Noise Sources”. Underneath the title, there are eight categories stemming from the sources which are traffic, transportation, building operation, homes, streets, harbor & river, collection deliveries, and miscellaneous. Each category is broken down again into more subcategories, to list the noises in each category which the user can hover over to listen to the different noises. In the Space interface, a vintage map of New York City is displayed with four different types points on the map including noise complaint, noise complaint with documents, complainant location, and newsreels. This allows the user to find and see the locations of the sounds and noise complaints. Some points will even have information boxes if you hover over them. In the Time interface, there is an interactive timeline with seven different types of points:noise complaint, noise complaint with documents, news reel, NY Times, Noise Abatement Commission,magazine, and misc documents. The user can explore different years by as well as find information regarding specific points in time, and even learn about people on the Noise Abatement Commission and even see real News Articles. This site was extremely organized and easy to navigate. The authors purposefully made their site to have the user feel immersed in New York City and to be hearing the sounds as if they were there, but they also made the site with clues such as the Google logo brightly displayed in the lower left corner of the map to bring the user back to reality. They did this to remind the user that “access to the past is always mediated through the technologies and inquiries of the present” and so that the user could form his/her own ideas from the information and not get caught up in the noises. The authors saw the importance of living in the present and the use of technology to further our thinking. The project is successful because although it allows to user to immerse themselves in the project, they aren’t completely in a virtual reality and rather can tell that they are navigating through the noises through a computer. The Roaring Twenties appealed to me as the subject for my blog post this week because, as a History major, the early 20th century is a subject of intense interest and fascination to me and a project which maps such a rarely explored aspect of historical moments, how it sounded, intrigued me immensely. The website is simple and relatively easy to use and offers a quick text introduction to explain the purpose of the Roaring Twenties project: recreating and archiving the sounds of New York City in the early 20th century. After the introduction you can access the main part of the website which offers a “Sound” portion of the project giving you an interactive soundboard of numerous New York City street sounds. The sources, like traffic, street signs, pedestrians, etc. are neatly and plainly explained and the soundboard is hidden in an old-timey 20’s newspaper aesthetic and it all fits together quite well. The next part of the project is ominously called “Space” and offers a large map that can be interacted with by your mouse cursor. You can zoom in and out giving you extra details like cars and noise pollution, you can use the Timeline which offers newspapers and other texts from a number of different years. Unfortunately this map is a little clunky and takes a while to load, and interacting with it is equally as slow but also runs the risk of crashing the entire browser. While a good idea, the “Space” portion clearly could use a fair amount of debugging. While not totally free of issues, The Roaring Twenties explores an aspect of history that I have never even thought of or truly considered as being possible to archive, and for that reason I have to recommend the site to anyone interested in digital humanities projects. When first opening the project, there is a long voiced narrative playing with long sound wave shaped figures moving. These figures shrink and grow and change shape. On the bottom of the screen, there is a menu bar that runs with four options: Help, Options, History, Transcription, and Index, with more sub-options within options, to control the audio. From my observations, I think this site is very easy to navigate and is user friendly overall. The project is very aesthetically pleasing and engaging to the user. However, when I first opened this project on my computer, I was a bit confused as to what my options were in navigation. Like many other websites and projects, I assumed there to be a short audio and visual introduction before displaying the content of the project. I sat in front of my computer and listened to this voice talk for several minutes after realizing that the voice was not an introduction- it was the content of the project. The different sound waves were the interview pieces of each different person. As I started clicking around, the voice still played and I discovered options to mute, play, and otherwise control the audio, and the transcription pieces and other written content of the project. That was when I fully understood how this project was designed. However, most of the content was not at all hard to navigate. My other criticism for this project are the layers of the pages. The background and audio continue to be present in the background as a faded backdrop. However, as we click more and more pages, they all overlap one another is the “close” button is not clicked. This makes the pages somewhat hard to read, and confusing as we close all the pages to clear the main page of the interface. Although there are a few design elements I disagree on, this project is successful. The idea behind the project as stated by the editor, is said to create a “subtle parity between the “user” of the interface and the IV drug “user” who is, for many of us, ordinarily held at a distance if not ignored entirely.” Unfortunately, I personally don’t think I would have understood this concept had I not read the editor’s statement and just explored the project on my own. After examining both, I understand the design of the project, but nowhere in the project does it explain or give obvious clues to the reasoning of it. The Vectors Journal: Public Secrets is a project dedicated to giving information on California’s Prison department by sharing personal stories from some of the female prisoners and general facts about the prison system in the form of an “outside” “inside” view. The site was extremely easy to navigate using the tabs called main menu, inside/outside, bare-life/human-life, and the public secret/utopia. In the editorial statement, Sharon Daniel describes the goal of the website is for the user to become more aware of the relationship between individual experiences and the broader social system as a “part of a larger resistance movement that aims to dismantle the prison system in pursuit of a more humane world.” The site does a great job of highlighting this goal through the construction of the site interface. The main menu’s background is split midway through the screen horizontally into black and white, gray words on each. The same look carries throughout each of the tabs. For each tab, the black and white background helps distinguish the separation between the perspectives or contrasting ideas that are presented on each tab like “inside” and “outside” perspectives on the prison. This visualization makes the different thoughts on the subject very concrete and easy to digest as a viewer. Within each tab, the information is presented by clicking on quotes that either appear in the black or white background, which represent the different perspectives presented in that tab. For example, in the “inside/outside” tab, quotes like “they can strip search you every time you come back from your job” appear in the black “inside” half of the screen while quotes like “women are getting blamed with more time for the same crime as men” in the white “outside” half of the screen. When you click on the quotes, an audio track plays of a women describing her story that involves the quote and the text written out. This format of presenting information is extremely powerful because just by looking at the screen, you can get an idea of what the site is trying to get across with the quotes, but there is an option to of further by investigating the quotes. Overall, the main design idea of separating the screen into black and white to represent different ways to look at the California prison system is effective and clear. Sharon Daniel and his team did a great job. On vectors, I explored Shi Jian – a project by Mark Hansen. The project aims to look at time and memory in their own components, dwelling on its tangibility, lapse, and functionality in our lives. More importantly, the site aims to explore digital image and how our uses and classification of it nowadays on digital platforms plays with the concept of “time”. Nowadays, there are so many images and algorithmic structures on the web that some of which, can be debated whether or not it still conforms to our own “human scales of time and memory”. In this project, Hansen archived six months worth of personal images and videos in Beijing. These images are lifestyle-based and are snapshots of familiar tourist scenes. What the user can do on this site is look at the image in different scales of time: Date, Place, Quality of Light, POV and Type of Time. Instead of viewing in albums or virtual tours, the image stands as a piece and function of time. Navigating the site, I was not immediately clear on the statement until I had read the editor’s introduction. Perhaps it is because we are so used to the social media way of organizing images and videos – into albums. The site did well in offering different conceptual way of viewing images and it became easier later on to look at images in different ways. I would have liked a better homepage on the site so that I am guided into this concept of looking at photos in a different way. The home page was more theoretical and included more philosophy of the topic – something that might be a little too hard to grasp for someone coming onto the site for the first time. The timeline concept was also an interesting visual for the site, however I did need more guidance on the significance of the images since sometimes it seems as though they had been chosen randomly. Overall, the site has an interesting idea that got me thinking differently – I just feel like I needed a little more guidance in the interface of it.